Type B aortic dissection, whether acute or chronic, is a challenging disease to manage successfully. The acute disease often presents as a complex range of pathologies, described as the acute aortic syndrome, often occurring as acute on chronic thoracoabdominal disease. This complexity makes acute Type B aortic dissection a challenging and rewarding condition to manage. 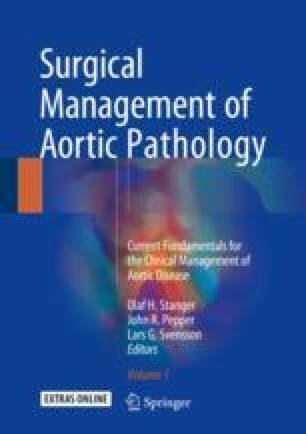 Unlike acute Type A dissection, the primary objective of acute Type B aortic dissection is to steward or shepherd the patient into a chronic state with good medical management. This may include simple medical control of blood pressure through to endovascular management of malperfusion syndromes or impending rupture. On occasions where life is threatened and there are no endovascular options, high-risk surgery may be the only option. Once successfully managed into the chronic state, intervention may be considered in the elective setting based on size, symptoms or expansion. Thoracoabdominal aortic surgery, even in the elective setting, requires experienced multidisciplinary teams to achieve successful outcomes.